Last year, I did a report that catalogued all the times NSA had violated FISA since the Stellar Wind phone dragnet got moved under FISA in 2004. There were the five different practices deemed violations of 1809(a)(2), which prohibits the use of any data that was illegally collected. In addition to those, NSA had continued to conduct back door searches of data collected using upstream 702 collection even after John Bates prohibited the practice in 2011. While Rosemary Collyer (who is the worst presiding FISA Judge ever) didn’t deem that a violation of 1809(a)(2) — meaning NSA didn’t have to segregate and destroy andy data collected improperly — it still violated the minimization procedures that control 702 collection. So between 2004 and 2016, NSA was always breaking the rules of FISA in one way or another. And we can now extend that timeline to 2018. The NSA just revealed that it had destroyed all the call detail records it had collected since 2015, which would be all those collected under USA Freedom Act. The Government relies on Title V of FISA to obtain CDRs, which do not include the content of any calls. In accordance with this law, the Government obtains these CDRs, following a specific court-authorized process. 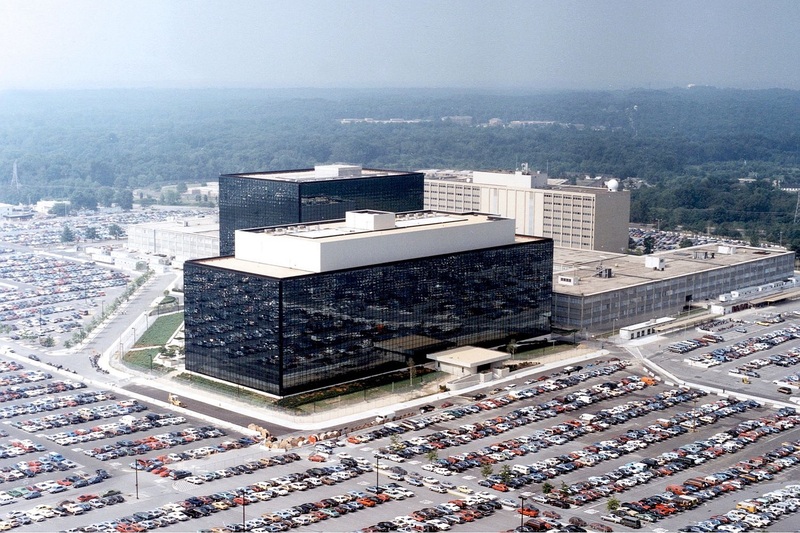 NSA is deleting the CDRs because several months ago NSA analysts noted technical irregularities in some data received from telecommunications service providers. These irregularities also resulted in the production to NSA of some CDRs that NSA was not authorized to receive. Because it was infeasible to identify and isolate properly produced data, NSA concluded that it should not use any of the CDRs. Consequently, NSA, in consultation with the Department of Justice and the Office of the Director of National Intelligence, decided that the appropriate course of action was to delete all CDRs. NSA notified the Congressional Oversight Committees, the Privacy and Civil Liberties Oversight Board, and the Department of Justice of this decision. The Department of Justice, in turn, notified the Foreign Intelligence Surveillance Court. The root cause of the problem has since been addressed for future CDR acquisitions, and NSA has reviewed and revalidated its intelligence reporting to ensure that the reports were based on properly received CDRs. Now it could well be these CDRs that NSA was not authorized to collect were selectors that went beyond what had been approved (though that’d be unlikely to trigger a technical alert). It may be these CDRs obtain something that counts as content — such as cookie information that identifies sublevel domains of a webpage. But the only non content thing that is affirmatively permitted in USAF is location data, which as of last week would get treated as a search if not content. Which leads me to believe this is most likely location data (which would also explain the sudden transparency). It may be content data collected in ways the NSA didn’t understand, perhaps via apps that retain the location data shared from the phone. But it’s likely it was content data. And given the specific reference to data “that NSA was not authorized to receive,” and the fact that NSA destroyed three years of CDRs, I suspect this, too, was deemed a violation of 1809(a)(2). Which means the NSA’s streak of violating FISA just got extended several more years. It has been violating FISA, in one way or another, for 14 years. FISA Court’s report: This provides a very useful description of approvals viewed from the FISA Court’s perspective. While it is the least deceptive report, FISC has only released one full year (2016) and one partial year (2015) report before, so it can’t be used to study trends or history. DOJ report: This is the mostly useless report, told from the government’s standpoint, reflecting how many final applications get approved. While it isn’t very useful for nuance, it is the only measure we can use to compare last year with the full history of FISA. DNI report: This is the report started in the wake of the Snowden leaks and codified in the USA Freedom Act and last year’s FISA Amendments Act. Parts of this report are very useful, parts are horribly misleading (made worse by new reporting requirements pass in the FAA reauthorization). But it requires more kinds of data than the other two reports. I’ve been meaning to write more on the transparency reports released some weeks ago (see this post debunking the claim that we can say the FISA Court has rejected more applications than in the past). But given some misunderstandings in this post, I thought it better to lay out some general principles about how to understand what the transparency reports show us. FISA is just one way that the government can collect data used for national security investigations, and because it involves a secret court, it attracts more attention than the many other ways. Worse, it often attracts the focus in isolation from other surveillance methods, meaning even experts fail to consider how authorities work together to provide different parts of the government all the kinds of data they might want. Additionally, an exclusive focus on FISA may blind people to how new restrictions or permissions in one authority may lead to changes in how the government uses another authority. Two examples of how FISA interacts with other authorities may help to demonstrate the importance of considering all these authorities together. For virtually the entirety of the time the government collected Internet metadata as metadata domestically, it was breaking the law (because the concepts of metadata and content don’t apply neatly to packet based collection). From 2009 to 2011, the government tried to fake their way through this (in part by playing games with the distinction between collection and access). By the end of 2011, however, that game became legally untenable. Plus, the restrictions the FISA Court imposed on dissemination rules and purpose (NSA was only permitted to collect this data for counterterrorism purposes) made the program less useful. As a result, the government moved the function of chaining on Internet metadata to two different areas: metadata collected under PRISM (which because it was collected as content avoided the legal problems with Internet metadata collection) and metadata collected under EO 12333 and made accessible to analysts under Special Procedures approved in 2008 and extended throughout NSA in early 2011. As I’ve laid out, the FISC actually takes notice of rulings in the criminal context — even at the magistrate level — and adjusts FISC rulings accordingly. They’ve done this with both Post Cut Through Dialed Digits and location data. When the FISC adopted a highest common denominator for location collection, it meant that, in jurisdictions where FBI could still obtain location data with a d order, they might do that for national security purposes rather than obtain a PRTT under FISA (to say nothing of the additional paperwork). More recently, we’ve gotten hints that FBI had ways to access cell phones in a national security realm that were unavailable in a criminal realm. This probably goes on all the time, as FBI Agents make trade offs of secrecy, notice to defendants, paperwork and oversight, and specific collection techniques to pursue national security investigations. We don’t get great numbers for FBI collection in any case, but what we do get will be significantly affected by these granular decisions made in secret. Additionally, it’s important to understand why surveillance laws get passed. CISA, for example, came about (among many other reasons) because Congress wouldn’t permit the government to conduct upstream collection using Section 702 for all cybersecurity purposes. Engaging in “voluntary” sharing with backbone providers gave the government data from all kinds of hostile actors (not just nation states), with fewer restrictions on sharing, no court oversight, and no disclosure requirements. Similarly, to this day, many privacy activists and journalists misunderstand why the government was willing (nay, happy!) to adopt USA Freedom Act. It’s not that the government didn’t collect mobile data. On the contrary, the government had been obtaining cell data from AT&T since 2011, and that was probably a resumption of earlier collection incorporating FISA changed rules on location collection. Nor was it about calling card data; that had been explicitly permitted under the old program. Rather, USAF gave the government the ability to require assistance, just as it can under Section 702. While that was instrumental in getting access to Verizon cell data (which had avoided complying because it did not retain business records in the form that complied with FISA collection rules), that also gave the ability to get certain kinds of data under the “session identifier” definition of call records in the law. Here’s a post on all the other goodies the government got with USA Freedom Act. One more important detail virtually unmentioned in coverage of this authority: the 215 dragnet (both the old one and the USAF one) intersect with a far vaster dragnet of metadata collected under 12333. The “bulk” is achieved — and has been since 2009! — using EO 12333 data, data which doesn’t have the same restrictions on things like location data that FISA data does. Section 215 is about getting records (and correlations) that aren’t available overseas, effectively filling in the holes in data collected overseas. All that is necessary background to understanding numbers that track just FISA (and NSL authorities). FISA is just one part of the always evolving national security collection the government does. And as permissive as a lot of people think FISA is, in many ways it is the most closely regulated part of national security collection. If your understanding of the phone dragnet replacing the old USA Freedom dragnet came from the the public claims of USA Freedom Act boosters or from this NYT article on the I Con the Record report, you might believe 42 terrorist suspects and their 3,150 friends made 48,000 phone calls last year, which would work out to 130 calls a day … or maybe 24,000 perfectly duplicative calls, which works out to about 65 calls a day. That’s the math suggested by these two entries in the I Con the Record Transparency Report — showing that the 42 targets of the new phone dragnet generated over 151 million “call detail records.” But as I’ll show, the impact of the 151 million [corrected] records collected last year is in some ways far lower than collecting 65 calls a day, which is a good thing! But it supports a claim that USAF has an entirely different function than boosters understood. Here’s the math for assuming these are just phone calls. There were 42 targets approved for use in the new phone dragnet for some part of last year. Given the data showing just 40 orders, they might only be approved for six months of the year (each order lasts for 180 days), but we’ll just assume the NSA gets multiple targets approved with each order and that all 42 targets were tasked for the entirety of last year (for example, you could have just two orders getting 42 targets approved to cover all these people for a year). In its report on the phone dragnet, PCLOB estimated that each target might have 75 total contacts. So a first round would collect on 42 targets, but with a second round you would be collecting on 3,192 people. That would mean each of those 3,192 people would be responsible for roughly 48,000 calls a year, every single one of which might represent a new totally innocent American sucked into NSA’s maw for the short term [update: that would be up to a total of 239,400 2nd-degree interlocutors]. The I Con the Record report says that, “the metric provided is over‐inclusive because the government counts each record separately even if the government receives the same record multiple times (whether from one provider or multiple providers).” If these were phone calls between just two people, then if our terrorist buddies only spoke to each other, each would be responsible for 24,000 calls a year, or 65 a day, which is certainly doable, but would mean our terrorist suspects and their friends all spent a lot of time calling each other. The number becomes less surprising when you remember that even with traditional telephony call records can capture calls and texts. All of a sudden 65 becomes a lot more doable, and a lot more likely to have lots of perfectly duplicative records as terrorists and their buddies spend afternoons texting back and forth with each other. Still, it may mean that 65 totally innocent people a day get sucked up by NSA. All that said, there’s no reason to believe we’re dealing just with texts and calls. Call Detail Records (CDR) – commonly referred to as “call event metadata” – may be obtained from telecommunications providers pursuant to 50 U.S.C. §1861(b)(2)(C). A CDR is defined as session identifying information (including an originating or terminating telephone number, an International Mobile Subscriber Identity (IMSI) number, or an International Mobile Station Equipment Identity (IMEI) number), a telephone calling card number, or the time or duration of a call. See 50 U.S.C. §1861(k)(3)(A). CDRs do not include the content of any communication, the name, address, or financial information of a subscriber or customer, or cell site location or global positioning system information. See 50 U.S.C. §1861(k)(3)(B). CDRs are stored and queried by the service providers. See 50 U.S.C. §1861(c)(2). Significantly, this parenthesis — “(including an originating or terminating telephone number, an International Mobile Subscriber Identity (IMSI) number, or an International Mobile Station Equipment Identity (IMEI) number)” — suggests that so long as something returns a phone number, a SIM card number, or a handset number, that can be a “call event.” That is, a terrorist using his cell phone to access a site, generating a cookie, would have the requisite identifiers for his phone as well as a time associated with it. And I Con the Record’s transparency report says it is collecting these “call event” records from “telecommunications” firms, not phone companies, meaning a lot more kinds of things might be included — certainly iMessage and WhatsApp, possibly Signal. Indeed, that’s necessarily true given repeated efforts in Congress to get a list of all electronic communications service providers company that don’t keep their “call records” 18 months and to track any changes in retention policies. It’s also necessarily true given Marco Rubio’s claim that we’re sending requests out to a “large and significant number of companies” under the new phone dragnet. The fine print provides further elements that suggest both that the 151 million events collected last year are not that high. First, it suggests a significant number of CDRs fail validation at some point in the process. This metric represents the number of records received from the provider(s) and stored in NSA repositories (records that fail at any of a variety of validation steps are not included in this number). At one level, this means NSA’s results resulted in well more than 151 million events collected. But it also means they may be getting junk. One thing that in the past might have represented a failed validation is if the target no longer uses the selector, though the apparent failure at multiple levels suggests there may be far more interesting reasons for failed validation, some probably technically more interesting. In addition, the fine print notes that the 151 million call events include both historical events collected with the first order as well as the prospective events collected each day. CDRs covered by § 501(b)(2)(C) include call detail records created before, on, or after the date of the application relating to an authorized investigation. So these events weren’t all generated last year — if they’re from AT&T they could have been generated decades ago. Remember that Verizon and T-Mobile agreed to a handshake agreement to keep their call records two years as part of USAF, so for major providers providing just traditional telephony, a request will include at least two years of data, plus the prospective collection. That means our 3,192 targets and friends might only have had 48 calls or texts a day, without any duplication. Finally, there’s one more thing that suggests this huge number isn’t that huge, but that also it may be a totally irrelevant measure of the privacy impact. In NSA’s document on implementing the program from last year, it described first querying the NSA Enterprise Architecture to find query results, and then sending out selectors for more data. Once the one-hop results are retrieved from the NSA’s internal holdings, the list of FISC-approved specific selection terms, along with NSA’s internal one-hop results, are submitted to the provider(s). In other words — and this is a point that was clear about the old phone dragnet but which most people simply refused to understand — this program is not only designed to interact seamlessly with EO 12333 collected data (NSA’s report says so explicitly, as did the USAF report), but many of the selectors involved are already in NSA’s maw. Under the old phone dragnet, a great proportion of the phone records in question came from EO 12333. NSA preferred then — and I’m sure still prefers now — to rely on queries run on EO 12333 because they came with fewer limits on dissemination. Which means we need to understand the 65 additional texts — or anything else available only in the US from a large number of electronic communications service providers that might be deemed a session identifier — a day from 42 terrorists and their 3150 buddies on top of the vast store of EO 12333 records that form the primary basis here. Because (particularly as the rest of the report shows continually expanding metadata analysis and collection) this is literally just the tip of an enormous iceberg, 151 million edge cases to a vast sea of data. 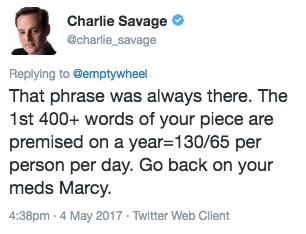 Update: Charlie Savage, who has a really thin skin, wrote me an email trying to dispute this post. In the past, his emails have almost universally devolved into him being really defensive while insisting over and over that stuff I’ve written doesn’t count as reporting (he likes to do this, especially, with stuff he claims a scoop for three years after I’ve written about it). So I told him I would only engage publicly, which he does here. Fundamentally, Charlie disputes whether Section 215 is getting anything that’s not traditional telephony (he says my texts point is “likely right,” apparently unaware that a document he obtained in FOIA shows an issue that almost certainly shows they were getting texts years ago). Fair enough: the law is written to define CDRs as session identifiers, not telephony calls; we’ll see whether the government is obtaining things that are session identifiers. The I Con the Record report is obviously misleading on other points, but Charlie relies on language from it rather than the actual law. Charlie ignores the larger point, that any discussion of this needs to engage with how Section 215 requests interact with EO 12333, which was always a problem with the reporting on the topic and remains a problem now. So, perhaps I’m wrong that it is “necessarily” the case that they’re getting non-telephony calls. The law is written such that they can do so (though the bill report limits it to “phone companies,” which would make WhatsApp but not iMessage a stretch). Yet having been told that that part of the post was not a response to him, Charlie nevertheless persisted in completely misunderstanding the post. I guess he still believed it was all about him. Maybe Charlie should spend his time reading the documents he gets in FOIA more attentively rather than writing thin-skinned emails assuming everything is about him? Update: Once I pointed out that Charlie totally misread this post he told me to go back on my meds. Since he’s being such a douche, I’ll give you two more pieces of background. 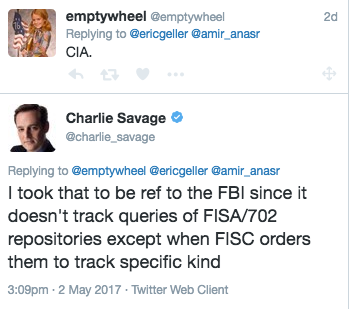 First, after I said that I knew CIA wasn’t tracking metadata (because it’s all over public records), Charlie suggested he knew better. 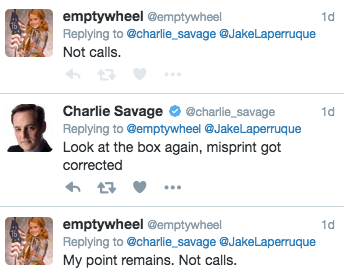 Here’s me twice pointing out that the number of call events was not (just) calls (as he had claimed in his story), a point he mostly concedes in his response. As you can see, Apple’s numbers were already rising from a baseline of 0-249 for both categories in the second half of 2014 (not incidentally when encryption became default), though really started to grow the first half of last year. Where the request-to-number-of-accounts affected ratio has differed, it shows more requests received than accounts affected, suggesting either that Apple is getting serial requests (first iMessage metadata, then content), or that the authorities are renewing requests — say, after a 90-day 215 order expires (though Apple reiterates in this report that they have never received a bulk order, so they are presumably, but not definitely, not the additional bulk provider that appears to have shown up in the June 29 order last year. The number of requests may have doubled or even nearly tripled in the reporting reflecting the first half of last year, and may have almost doubled again, but it appears that Apple continues to get multiple orders affecting the same account. In other words, this appears to be a spike in the number of accounts affected, accompanied by a more gradual spike in the orders received, but it follows on what could be a straight doubling of both categories from the prior period. It appears Apple is reporting under paragraph 3 reporting, described as follows. (B) the total number of customer selectors targeted under all national security process received, including all national security letters, and orders or directives under this Act, combined, reported in bands of 250 starting with 0-249. (2) A report described in paragraph (3) of subsection (a) shall include only information relating to the previous 180 days. That should work out to the same reporting method they were using, provided there was no 2-year delay in reporting of a new kind of production, which doesn’t appear to have happened. One possible explanation of what’s partly behind the increase is that the more recent number reflects USA Freedom Act collection. USAF became law on June 2, with the new 2-hop production going into effect on November 29. Marco Rubio made it clear last year that USAF extended the 2-hop collection to “a large number of companies.” The Intelligence Authorization made it clear a fair number of companies would be covered by it as well. In its discussion of what kind of responses it gave to San Bernardino requests Apple said they got legal process. Especially given that Apple is a “phone company,” it seems highly likely the government included iMessage data in its roll out of the expanded program (which, multiple witnesses have made clear, was functioning properly in time for the December 2 San Bernardino attack). So it’s quite possible what look to be 500 first-time requests are USAF’s new reporting, though that would seem to be a very high number of requests for the first month of the program. Probably, the bulk of the increase is from something else, perhaps PRISM production, because iMessage is an increasing part of online communication. Apple’s numbers are still far below Google’s (though Yahoo’s had a big drop off in this reporting period). But it would make sense as more people use iMessage, it will increase Apple’s PRISM requests. Update: This post has been updated to better reflect my understanding of how this reporting and the new production work. NSA Privacy Officer Rebecca Richards Explains What Connection Chaining Is! You’ll recall that for the year and a half that Congress was percolating over USA Freedom Act, I was trying to figure out what “connection chaining” was, but no one knew or would say? The description of phone dragnet hops as “connections” rather than calls showed up in early versions of the bill and in dragnet orders since 2014. Ultimately, the final bill used language to describe hops that was even less explanatory, as all it requires is a session identifier connection (which could include things like cookies), without any call or text exchanged. In documents released yesterday, NSA’s Privacy Officer Rebecca Richards has offered the first explanation of what that chaining process looks like. NSA’s Civil Liberties and Privacy Office released a privacy report and minimization procedures on USAF. Curiously, the privacy report doesn’t describe two hops of provider data, though that’s meaningless, as the queries will automatically repeat “periodically” (described as daily in the bill), so the government would obtain a second hop from providers by the second day at the latest. Rather, it describes a first hop as occurring within NSA’s Enterprise Architecture, and the results of that query to be sent to providers for a second hop. Collection: The FISC-approved specific selection term, along with any one-hop results generated from metadata NSA already lawfully possesses from previous results returned from the provider(s) and other authorities, will be submitted to the authorized provider(s). The provider(s) will return CDRs that are responsive to the request, meaning the results will consist of CDRs that are within one or two hops of a FISC-approved specific selection term. This step will be repeated periodically for the duration of the order to capture any new, responsive CDRs but in no case will the procedures generate third or further hops from a FISC-approved specific selection term. Here’s the key part of the picture included to describe the NSA hop that precedes the provider hop. The report is laudable for its very existence (I’m pestering FBI to see if we’ll get one from them) and for its willingness to use real NSA terms like “Enterprise Architecture.” It is coy in other ways, such as the full role of the FBI, the type of records queried, and — especially — the type of providers included; for the latter, the report cites page 17 of the House report, which only describes providers in this paragraph, using terms — phone company and telecommunications carrier — that are ambiguous and undefined (though someone like Apple could launch a nice lawsuit on the latter term, especially given that they are refusing to provide a back door in a case in EDNY based on the claim they’re not a carrier). That said, we know the term provider must be understood fairly broadly given the expanded number of providers who will be included in this program. What this means, in effect, is that NSA and FBI (the latter does the actual application) will get a specific identifier — which could be a phone number, a SIM card number, a handset identifier, or a credit card [correction: this should be “calling card”], among other things — approved at the FISC, then go back to at least NSA’s data (and quite possibly FBI’s), and find all the contacts with something deemed to “be” that identifier that would be meaningful for a “phone company” to query their own records with, up to and including a cookie (which is, by definition, a session identifier). Even in the report’s description of this process, there’s some slippage in the NSA query step, from an initial RAS approved phone number (202) 555-1234 to an NSA identified number from the (202) area code not provided, making an additional call. To illustrate the process, assume an NSA intelligence analyst identifies or learns that phone number (202) 555-1234 is being used by a suspected international terrorist. This is the “specific selection term” or “selector” that will be submitted to the FISC (or the Attorney General in an emergency) for approval using the RAS standard. Also assume that, through NSA’s examination of metadata produced by the provider(s) or in NSA’s possession as a result of the Agency’s otherwise lawfully permitted signals intelligence activities (e.g., activities conducted pursuant to Section 1.7(c)(1) of Executive Order 12333, as amended), NSA determines that the suspected terrorist has used a 202 area code phone number to call (301) 555-4321. The phone number with the 301 area code is a “first-hop” result. In turn, assume that further analysis or production from the provider(s) reveals (301) 555-4321 was used to call (410) 555-5678. The number with the 410 area code is a “second-hop” result. And in this part of the report, the provider query will return any session identifier that includes the selection terms (though elsewhere the report implies only contacts will be returned). Once the one-hop results are retrieved from the NSA’s internal holdings, the list of FISC-approved specific selection terms, along with NSA’s internal one-hop results, are submitted to the provider(s). The provider(s) respond to the request based on the data within their holdings with CDRs that contain FISC-approved specific selection terms or the one-hop selection term. One-hop returns from providers are placed in NSA’s holdings and become part of subsequent query requests, which are executed on a periodic basis. Described in this way, the query process sounds a lot more like what the version of the bill I dubbed USA Freedumber authorized than what the language of USA F-ReDux authorized: two steps of provider queries based off the connected selectors identified at NSA. Given the breathtaking variety of selector types the NSA uses, this could represent a great deal of queries on the provider side, many tracking user activity rather than user communications. And, at least given how the privacy report describes the transparency reporting, neither those interim NSA selectors nor cookies showing user activity but not communication of information would get counted in transparency reports. The number of targets under each order: Defined as the person using the selector. For example, if a target has a set of four selectors that have been approved, NSA will count one target, not four. Alternatively, if two targets are using one selector that has been approved, NSA will count two targets. The number of unique identifiers used to communicate information collected pursuant to an order: Defined as each unique record sent back from the provider(s). This approach seems to solve a problem the NSA appears to have been having since 2009, how to query entirely domestic records with identifiers that have been algorithmically determined to be used by the same person. Here, the NSA will be able to match connected selectors to an approved one, and then send all of them to providers to obtain entirely domestic records. But if I’m right in my reading of this, it leaves one hole in the privacy analysis of the this report. Richards measures USAF, as she has other programs, against the Fair Information Practice Principles, which include a measure of Data Quality and Integrity. But the report’s analysis of that in this program completely ignores how central NSA’s own data is in the process. Each CDR is a business record generated by a provider for the provider͛’s own business use. NSA plays no role in ensuring that the provider-generated CDRs accurately reflect the calling events that occurred over the provider’s infrastructure, but the provider(s) have their own policies, practices, and incentives for ensuring the accuracy of their records͘. NSA’s requirements for ensuring accurate, relevant, timely, and complete CDRs begin when NSA submits query requests to the provider(s), and the provider(s), in response, produce CDRs to the Agency. At least given the description laid out throughout this report, that’s entirely wrong! NSA is centrally involved in getting from the initial selector to the selectors submitted to the providers for query. So if the NSA’s analysis, which as described may include algorithmic matching of records, is inaccurate (say, by matching burner phones inaccurately), than the provider query will return the phone and other records of completely unassociated individuals. I can’t see any way that the NSA’s own query can be exempted from accuracy review here, but it has been. I absolutely assume NSA is confident in its analysis, but to just dismiss it as uninvolved when it precedes the provider query ignores the implementation architecture laid out in this report. In any case, I’m grateful we’ve got this report (I may have more to say on the minimization procedures, but they, like the report, are far clearer than the ones included in the old dragnet and for Section 702, perhaps because of the involvement of a Privacy Officer). I’m still thinking through the privacy implications of this. But really, this querying process should have been revealed from the start. https://www.emptywheel.net/wp-content/uploads/2016/07/Logo-Web.png 0 0 emptywheel https://www.emptywheel.net/wp-content/uploads/2016/07/Logo-Web.png emptywheel2016-01-15 12:28:472016-01-20 15:38:55NSA Privacy Officer Rebecca Richards Explains What Connection Chaining Is! I Con the Record released two statements to mark the end of the Section 215 phone dragnet (which will take place at midnight tomorrow night): a statement and a “fact” sheet. They’re a curious mix of true statements, false statements, and probably false statements. Moreover, the overall volume of call detail records subject to query pursuant to court order is greater under USA FREEDOM Act. Right now, the Section 215 phone dragnet is not getting some cell records, probably not getting all VOIP, and probably not getting non-telephony messaging. Even just the cell records creates holes in the dragnet, and to the extent it doesn’t collect Internet based calls and messaging, those holes would be especially problematic. Which is why I’m struck by this language. When will NSA implement the new, selected telephony metadata process required by the USA FREEDOM Act? As I’ve noted, USA Freedom Act is technology neutral — the language of the law itself would permit collection of these other kinds of metadata. And while the House report says it applies to “phone companies,” it would be hard to argue that the maker of the most popular phone handset, Apple, is not a phone company, or handset/software manufacturers Google or Microsoft. So I suspect this is technically inaccurate. Then there’s the deliberately misleading language, which is most notable in these passages but appears throughout. On November 29, the transition period ends. Beginning Sunday, November 29, the government is prohibited from collecting telephone metadata records in bulk under Section 215, including of both U.S. and non-U.S. persons. That approach was enshrined in the USA FREEDOM Act of 2015, which directs that the United States Government will no longer collect telephony metadata records in bulk under Section 215 of the USA PATRIOT Act, including records of both U.S. and non-U.S. persons. I’m sure the government would like terrorists and the press to believe that it “will no longer collect telephony metadata records in bulk … including records of both U.S. and non-U.S. persons.” In which case, this construction should be regarded as a huge success, because some in the press are reporting that the phone dragnet will shut down tomorrow night. Just a tiny corner of the phone dragnet will shut down, and the government will continue to collect “telephony metadata records in bulk … including records of both U.S. and non-U.S. persons” under EO 12333. Hypothetically, for every single international call that had been picked up under the Section 215 dragnet and more (at a minimum, because NSA collects phone records overseas with location information), a matching record has been and will continue to be collected overseas, under EO 12333. They’re still collecting your phone records in bulk, not to mention collecting a great deal of your Internet records in bulk as well. BREAKING. There’s one more misleading passage. The legal framework permits providers to return call detail records which are either one or two “hops” away from a FISC-approved, terrorist-associated selection term. First hop selection terms (e.g., those that are in direct contact with a FISC-approved selection term) may be obtained from providers as well as from information identified independently by the government. These first hop selection terms may then be sent by NSA as query requests to the providers to obtain second hop records. I Con the Record offers “those [call detail records] that are in direct contact with a FISC-approved, terrorist approved selection term” as an example of what it gets at each hop. But the language no longer requires that a “contact” be made — only that a connection be made. So it’s quite possible NSA will collect call detail records (which only need be a session identifier, so it doesn’t require any call actually be placed) of people who have never technically “contacted” the target. There’s a reason they call this “I Con the Record,” you know. But I think both are misreading what the Second Circuit tried to do with this. Take Kerr’s suggestion that the initial ruling from the Second Circuit got Congress to act. He doesn’t say what he means by that (or which civil libertarians he had in mind when asserting that). The earlier decision certainly added pressure to get the bill through Congress. Congress passed the Freedom Act in part to prohibit bulk telephone metadata collection, and in doing so endorsed our understanding of the key term “relevance.” See H.R. Rep. No. 114‐109, at 19. Lynch goes on to cite the House report on the bill to support this claim. Section 103 of the Freedom Act, titled “Prohibition on Bulk Collection of Tangible Things,” states that “[n]o order issued under this subsection may authorize the collection of tangible things without the use of a specific selection term” that meets certain requirements. Id. The purpose of § 103 is to “make clear that the government may not engage in indiscriminate bulk collection of any tangible thing or any type of record.” H.R. Rep. No. 114‐109, pt. 1, at 18 (2015). Section 103 is also intended to “restore meaningful limits to the ‘relevance’ requirement of Section 501, consistent with the opinion of the U.S. Court of Appeals for the Second Circuit in ACLU v. Clapper.” Id. at 19. He cites language point to an entire section that the House says will restore limits to the relevance requirement of a section of a law “consistent” with his own earlier opinion. All that said, it’s not clear that USA F-ReDux, as written, does do that. That’s true, first of all, because while the House report specifically states, “Congress’ decision to leave in place the ‘relevance’ standard for Section 501 orders should not be construed as Congress’ intent to ratify the FISA Court’s interpretation of that term” (Lynch cites this language in his opinion), it also doesn’t state that Congress intended to override that definition. What the bill did instead was leave the word “relevant” (still potentially meaning “all” as FISC defined it) in place, but place additional limits for its application under FISA. Moreover, I’m not convinced the limits as written in USA F-ReDux accomplish all that the Second Circuit’s earlier opinion envisioned, which is perhaps best described in the ways the dragnets didn’t resemble warrants or subpoenas. Moreover, the distinction is not merely one of quantity – however vast the quantitative difference – but also of quality. Search warrants and document subpoenas typically seek the records of a particular individual or corporation under investigation, and cover particular time periods when the events under investigation occurred. The orders at issue here contain no such limits. The metadata concerning every telephone call made or received in the United States using the services of the recipient service provider are demanded, for an indefinite period extending into the future. The records demanded are not those of suspects under investigation, or of people or businesses that have contact with such subjects, or of people or businesses that have contact with others who are in contact with the subjects – they extend to every record that exists, and indeed to records that do not yet exist, as they impose a continuing obligation on the recipient of the subpoena to provide such records on an ongoing basis as they are created. In other words, Lynch used this second opinion to do more than say the Second Circuit was “done with it.” He used it to interpret USA F-ReDux — and the word “relevant” generally, outside of FISA, and to do so in ways that go beyond the clear language of the bill. Vladeck is wrong when he suggested the Second Circuit would assess “whether and to what extent the Fourth Amendment applies to information we voluntarily provide to third parties” — that is, the Third Party Doctrine generally. The Second Circuit made it quite clear throughout that they were interested in the application of “relevant,” not whether the Third Party Doctrine still applied generally, which is probably why Lynch isn’t that worried about the injury recurring. And I think Lynch used this opinion — one the government can’t really appeal — to suggest the application of USA F-ReDux is broader than it necessarily is, and to suggest the narrowing of “relevant to” is more general than it would be under USA F-ReDux (which applies just to certain sections of FISA, but not to the definition of “relevant” generally). It’s not clear how useful the opinion will be in restricting other over-broad uses of the word “relevant” (especially given DEA claims it has eliminated its dragnet). But I do suspect, having interpreted the law as having narrowed the meaning of the law, Lynch felt like he had limited the egregious constitutional injury. As promised, today ACLU asked the Second Circuit to enjoin the NSA’s collection of their phone records under the renewed phone dragnet. Accordingly, Plaintiffs respectfully ask that the Court now grant the preliminary relief it refrained from granting in its earlier decision. Specifically, Plaintiffs ask that the Court issue a preliminary injunction (i) barring the government, during the pendency of this suit, from collecting Plaintiffs’ call records under the NSA’s call-records program; (ii) requiring the government, during the pendency of this suit, to quarantine all of Plaintiffs’ call records already collected under the program; and (iii) prohibiting the government, during the pendency of this suit, from querying metadata obtained through the program using any phone number or other identifier associated with them. The filing offers the Second Circuit to provide an alternative interpretation of the events of early June, one that actually incorporated their earlier opinion as binding. It even flips the ratification argument FISC has long clung to to argue that by not altering the program while taking explicit notice of the Second Circuit decision, Congress had to have been ratifying the Second Circuit’s ruling that bulk collection under Section 215 was unlawful. In the present context, as in most others, the most reliable indicator of congressional intent is the text of the law. Here, that text admits no ambiguity. It makes clear that Congress intended to leave the government’s surveillance authority with respect to call records unaltered for the 180 days after the passage of the Act. The FISC seems to have reasoned that Congress must have intended to authorize bulk collection during the transitional period because it did not expressly prohibit it. See id. at 10–11 (“Congress could have prohibited bulk data collection . . . .”). But the FISC has it backwards. In our democracy, the government has only the powers the people have granted it; the question is not what surveillance Congress has proscribed, but what surveillance it has permitted. Moreover, here Congress was legislating in the shadow of this Court’s May 7 opinion, which indicated that this Court—the only appellate court to have construed the statute—would continue to construe the statute to disallow bulk collection unless Congress amended it to expressly authorize such collection. See, e.g., Clapper, 785 F.3d at 818 (stating that the Court would read the statute to authorize bulk collection only if Congress authorized it in “unmistakable language”); id. at 819 (stating that the government’s proposed construction of the statute would require “a clearer signal” from Congress); id. at 821 (indicating that, if Congress wanted to authorize bulk collection under the statute, it would have to do so “unambiguously”); see also id. 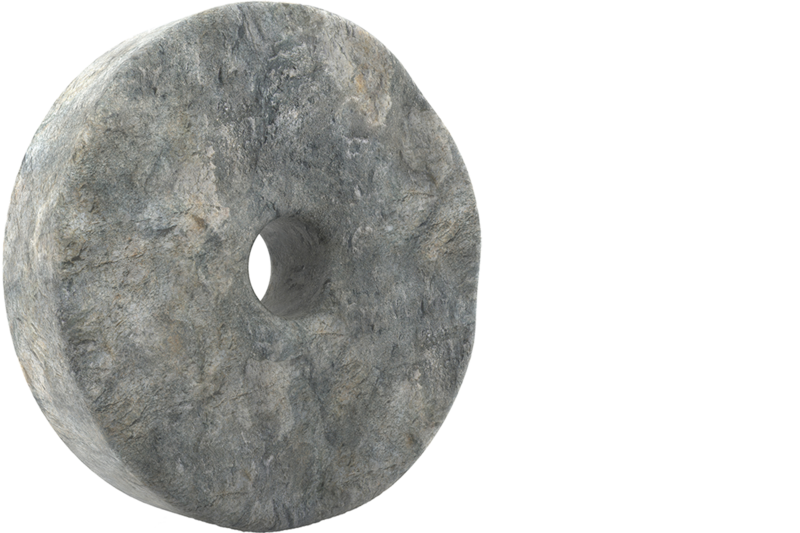 at 826–27 (Sack, J., concurring). This Court’s May 7 opinion was cited hundreds of times in the legislative debate that preceded the passage of the Act; it was summarized at length in the committee report; and one senator even read large parts of the opinion into the legislative record. See 161 Cong. Rec. S3331-02 (daily ed. May 31, 2015) (statement of Sen. Rand Paul); H. Rep. No. 114-109, at 8–10 (2015); June 2 Application at 9 n.2 (“Congress was aware of the Second Circuit’s opinion . . . .”). Against this background, it would be bizarre to understand Congress’s “failure” to expressly prohibit bulk collection as an implicit endorsement of it. Indeed, if it has any bearing at all, the doctrine of legislative ratification favors Plaintiffs. The argument is not entirely convincing, but it has the advantage of being less ridiculous than FISC’s claim that Congress ratified a court ruling that 1) Congress didn’t know about and that 2) FISC had never written up into an opinion. Ultimately, though, this seems to be an invitation to the Second Circuit to weigh in on FISC’s surly refusal to pay attention to a Circuit Court ruling. The FISC specifically rejected the reasoning of this Court’s May 7 ruling, writing that it rested “[t]o a considerable extent . . . on mischaracterizations of how [the call-records program] works and on understandings that, if they had once been correct, have been superseded” by the USA Freedom Act. Id. at 16. On the issue of the constitutionality of the call-records program, the FISC judge reaffirmed earlier FISC opinions holding that the issue was controlled by Smith v. Maryland, 442 U.S. 735 (1979), and that the call-records program was, therefore, consistent with the Fourth Amendment. Of course, we’re faced with a jurisdictional conflict, one discussed at length in a hearing immediately after the Second Circuit ruling. Sunlight Foundation’s Sean Vitka: Bob, I have like a jurisdictional question that I honestly don’t know the answer to. The Court of Appeals for the Second Circuit. They say that this is unlawful. Obviously there’s the opportunity to appeal to the Supreme Court. But, the FISA Court of Review is also an Appeals Court. Does the FISC have to listen to that opinion if it stands? Bob Litt: Um, I’m probably not the right person to ask that. I think the answer is no. I don’t think the Second Circuit Court of Appeals has direct authority over the FISA Court. I don’t think it’s any different than a District Court in Idaho wouldn’t have to listen to the Second Circuit’s opinion. It would be something they would take into account. But I don’t think it’s binding upon them. Vitka: Is there — Does that change at all given that the harms that the Second Circuit acknowledged are felt in that jurisdiction? Litt: Again, I’m not an expert in appellate jurisdiction. I don’t think that’s relevant to the question of whether the Second Circuit has binding authority over a court that is not within the Second Circuit. I don’t know Patrick if you have a different view on that? Eoyong: On the program itself. Patrick Toomey: The defendants in the case are the agency officials. And so an injunction issued by the Second Circuit would be directed at those officials. Because FISC has its own appellate court, the FISA Court of Review (FISCR), it doesn’t have to abide by what the Second Circuit rules, especially not if FISCR issues its own ruling on the same topic. For that reason, I reiterate my prediction that the FISC may resort to using a provision in the USA F-ReDux to eliminate the Second Circuit’s ability to weigh in here. USA F-ReDux affirmatively permitted the FISC to ask the FISCR to review its own decisions immediately, what I’ve dubbed FISCR Fast Track. It was dubbed, naively, as a way to get appropriate appellate review of the FISC’s secret decisions (yet the provision, as written, never requires any adversary, so it doesn’t address the problems inherent to the FISC). But here, there’s no reason for such secret review and an appellate court has already weighed in. But that doesn’t mean the government can’t use it. In other words, if the Second Court rules in a way the FISC doesn’t like (which they already have), if the FISC just wants to reiterate that this is one situation where the FISC gets to override the judgments of appellate courts (which the FISC has already done), or if the FISC just wants to set the precedent that no FISC decision will ever be reviewed by a real court, it can ask the FISCR to weigh in (and given FISC’s refusal to call in a real advocate, the FISCR would even have precedent to blow off that suggestion). The FISC has the ability to undercut the Second Circuit. And they’ve already shown a desire to do just that. Beware FISCR Fast Track, because it could really threaten any ability to review these kangaroo court decisions.